Jasna Dimitrijević (1979 Negotin) graduated from the Department of Comparative Literature and Literary Theory in Belgrade. She writes short stories, poetry and reviews. She is a regular contributor to the magazine Liceulice. She is the co-organizer of the first regional competition for the best short story on the topic of reconciliation on the BHSC, Albanian and Macedonian language – Biber – and the co-editor of the multilingual collection. 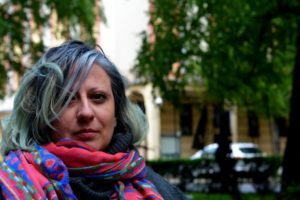 Her first collection of stories, Prepoznavanja, came out in 2015 and was published by the City Library Karlo Bijelicki, Sombor, after she won the contest for the first book, and the Redbox publishing house will publish the next edition of this book next year. Currently, she is finishing her second collection of short stories, which will be published by the end of 2018 by Partizanske knjige. She lives in Belgrade and works in a bookstore.